Hosted by WIPO, Pat-INFORMED is a public-private partnership between WIPO and the International Federation of Pharmaceutical Manufacturers and Associations (IFPMA), which also provides a platform where procurement agencies can make direct enquiries to companies. Pat-INFORMED hosts information on over 14,000 individual patents, for 600 patent families and 169 International Nonproprietary Names. It covers HIV/AIDS, cardiovascular diseases, diabetes, hepatitis C, oncology, respiratory conditions, and all products on the World Health Organization Essential Medicines List which are not within the six areas aforementioned. The launch of Pat-INFORMED took place alongside of the 58th WIPO General Assembly. 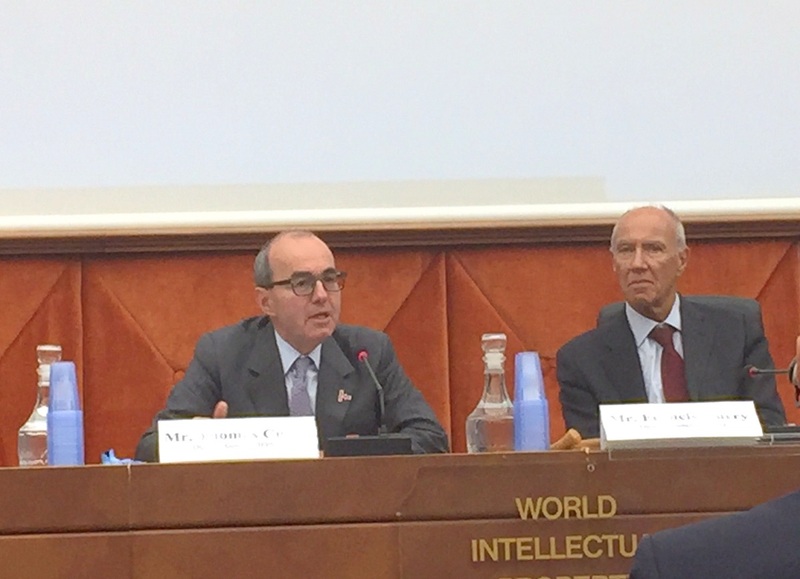 WIPO Director General Francis Gurry, at the launch, said the exercise of gathering patent information was more complex than originally imagined and it took important efforts for companies to curate data. “The result is a step forward in the extraordinarily complex field” of availability and access to medicines, said Gurry. Thomas Cueni, IFPMA director general, said when the Memorandum of Understanding was signed between WIPO and IFPMA, the amount of work needed to set up the initiative was not quite known (IPW, Health & IP, 3 October 2017). Patents are an essential tool to support innovation, Cueni said, however, “the patent system can seem complex to the un-initiated.” In principle, patent information is public, he explained, but is not easy to find and this difficulty leads to inefficiency in procurement. Pat-INFORMED’s main purpose is to help procurement agencies assess the patent status of medicines, he said, adding that for the moment the database includes only small molecules, but IFPMA is committed to continue to work to make the database an even better tool in the future. “You want to be in because it is a great initiative,” Cueni said about Pat-INFORMED, characterising it as a “fantastic partnership,” which will allow many more patients to get access to medicines faster. Also speaking at the event was Alicja Adamczak, president of the Patent Office of Poland. Pat-INFORMED currently includes 20 research-based biopharmaceutical companies: AbbVie (United States), Astellas Pharma Inc. (Japan), Bristol-Myers Squibb (US), Daiichi-Sankyo (Japan), Eisai (Japan), Gilead Sciences Inc. (US), GlaxoSmithKline (United Kingdom), IPSEN (France), Johnson & Johnson (US), Leo Pharma (Denmark), Lilly (US), Merck KGaA (Germany), Merck & Co. Inc. (US), Novartis (Switzerland), Novo Nordisk (Denmark), Pfizer (US), Roche (Switzerland), Shionogi Inc. (Japan), Takeda (Japan), and UCB (Belgium). “While information about patent applications and grants reside in the public domain, resources that directly link patents to medicines already on the market are scarce and limited,” according to a WIPO-IFPMA press release. Although some countries have overcome this challenge and maintain databases, such as the US “Orange Book” listing patents that are relevant to each drug, most countries have not, the authors said. According to the paper, through Pat-INFORMED, all participating companies have committed to respond to enquiries from procurement agencies. A speaker at the event was Wesley Kreft, director for global supply chain at I+solutions, a global procurement agency that carries out procurement for the Global Fund for AIDS, Tuberculosis and Malaria, governments and other international agencies and NGOs. He told Intellectual Property Watch that Pat-INFORMED is complementary to other databases, such as MedsPaL of the Medicines Patent Pool. Speakers in the event explained that Pat-INFORMED is not able, for instance, to provide information about third parties, or about pricing of products. Pat-INFORMED has a broader spectrum than MedsPaL, he said. Information that I+solutions gets from patent offices may not be complete and the opportunity to check both the patent offices and an industry-maintained database is very interesting, he said. The ability, through Pat-INFORMED, to contact directly the right person in the company holding a patent is an added advantage of the database, he said, explaining that it is often very difficult to find the right person to answer questions about patent status in companies. During the launch, Kreft said Pat-INFORMED will eliminate a lot of back and forth between procurement agencies and pharmaceutical companies. Procurement agencies will know faster if they can approach generic manufacturers, he said. He underlined the added difficulty to find information when IP offices in some countries have paper-based patent information. The response time can be two or three months, he told Intellectual Property Watch, which delays the procurement process. Alisa Harbin, head of global intellectual property at Novartis, said the company firmly supports the patent system, as an innovation enabler. However, the information contained in patents should be available as part of the contract with the public, she said. When this information is public, it is possible to further enhance the innovation, she added. Novartis joining Pat-INFORMED is part of the company’s effort at increasing transparency of patents to help procurement agencies to make informed decisions, she said. "WIPO And Pharma Industry Launch Medicines Patent Database For Easier Access To Medicines" by Intellectual Property Watch is licensed under a Creative Commons Attribution-NonCommercial-ShareAlike 4.0 International License.